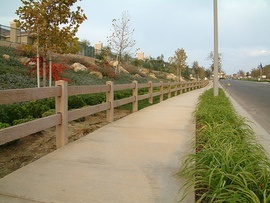 A barrier or railing, often associated with ranches and farms, typically made of wood (or vinyl) and composed of posts and a varying number of horizontal rails. Ranch-style fences are fairly short (2.5 to 3 ft. tall) and offer minimal privacy/security. They are generally used for decorative purposes, to keep horses and livestock from wandering, and to prevent large wildlife from entering pastures. Ranch-style fences are generally the most economical type of fence, costing roughly $3 to $6 per linear foot.